The Bullet® Bare Fiber Adapter is a most affordable and easy method for temporarily connecting bare fiber with all industry standard connectors. The Bullet® provides a simple and easy method to quickly interconnect any standard fiber connector to a piece of unterminated (bare) fiber to meet service, test or communication requirements. A few unique and distinctive features set the Bullet® apart from other available products. These features are the fiber holding mechanism, removable - interchangeable connector modules (tips) and the small amount of bare fiber required to expose after cleaving for insertion. The Bullet® was also recognized worldwide as a Technology Award Finalist for a product which demonstrated the widest range of technological merit, usefulness to the marketplace and design. The Bullet® is engineered out of aluminum with stainless steel connector modules. Fiber Plus International's micropad system is incorporated into the adaptor body. The micropads clamp onto the fiber to hold it secure during testing. Up to 900uM buffer size can fit into the adaptor which significantly reduces the amount of fiber that needs to be exposed. The amount of bare fiber needed after cleaving will vary per connector style. Typically only .55" of fiber is needed after cleaving. Certain connectors require as little as .14" exposed after cleaving. The smaller amount of bare fiber require to be expose reduces fiber waste and the possibility of breaking or damaging the fiber during the installation process. 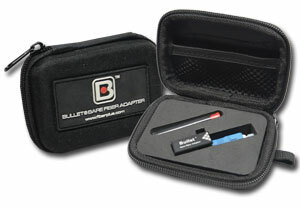 The Bullet® Bare Fiber Adapter is totally reusable! If a fiber happens to break off inside the adaptor, simply loosen the thumb screw and remove the connector module from the adapter body. The removable connector module feature allows the user to clean out the broken debris directly from the ferrule. Clean out wire is supplied to assist in pushing the broken debris out. The connector modules are not only removable, but also interchangeable. When an application requires a different type of connector, remove the current connector module from the adapter body and replace it with the desired type. 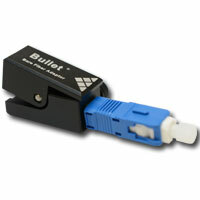 The Bullet® Bare Fiber Adapter body is designed to accept all of Fiber Plus International's connector modules. 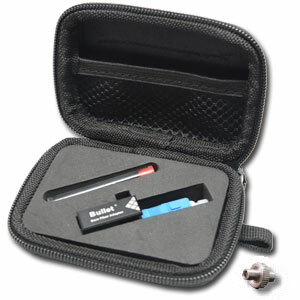 The interchangeable feature enables Fiber Plus International to offer Bullet® Bare Fiber Adapter Kits. If you use more than one connector style or both singlemode and multimode connectors, you may want to consider a Bullet® Bare Fiber Adapter Kit. The kits offer the same performance with the flexibility of switching out different connector modules when required. If you think you may be interested in a kit, check out the K Series Bullet® Bare Fiber Adapter Kits. Includes: Case, Bullet® Bare Fiber Adapter, *QuickLINK® Universal 2.5mm Mating Sleeve, Vial of Clean-out Wire and Instruction Sheet. *The QuickLINK® allows the Bullet® Bare Fiber Adapter to quickly connect to any patch/jumper cable with FC/PC, ST/PC or SC/PC connector. Will not work with APC connectors. The PFS® is an accessory that assists in aligning the fiber flush with the end of the connector face on the Bare Fiber Adapter. A vital accessory when connecting directly to test equipment. Protects the cleaved fiber end and equipment from damage. The QuickLINK® is a universal mating sleeve that links FC, ST and SC connectors together in any combination. No more need to carry around a variety of hybrid adapters to match up patch/jumper cables to your Bare Fiber Adapter. 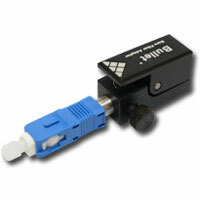 The QuickLINK® will allow your Bullet® Bare Fiber Adapter to connect to FC/PC, ST/PC, SC/PC, DIN/PC and E2000/PC patch/jumper cables.